Ever feel like you’re just a face in the crowd with an average job and average life? This book will change all that for you. 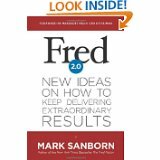 In Fred 2.0 you’ll learn the secrets of turning an average existence into a truly fulfilling and rich life. You don’t have to change locations or vocations to be spectacular. It all started with a mailman named Fred who made an extraordinary difference in the lives of all the customers on his route. If you are one of the millions of Freds, I promise this book will light a passion in you that you haven’t experienced in a long time, because you’ll learn how to take ordinary and make it extraordinary. Mr Sanborn reminds us that life is what you make it. If you need a shot in the arm or maybe a good old-fashioned kick in the pants, this book will inspire and challenge you to be all you can be.